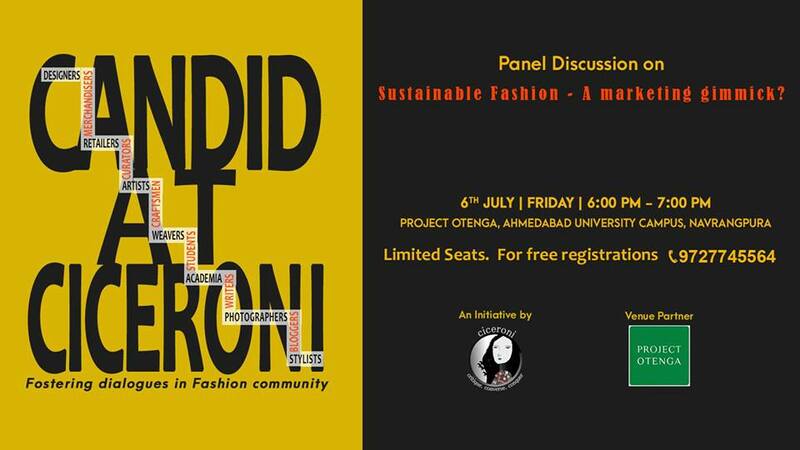 “CANDID AT CICERONI” is Ahmedabad’s first of its kind initiative by Ciceroni to promote free-wheeling dialogues in Fashion and Lifestyle fraternity. We aim to create an ecosystem that encourages discussion among the Fashion fraternity; be it fashion history, pattern making, cultural fashion, textile talks, craft forms, trend forecasts, inspirational journeys, challenges in sector or policy advocacy. We dream to bring all fashion students, academia, practising designers, stylists, photographers, retailers and curators together regardless of where they graduated from. How sustainable is sustainability? Is it the new marketing jargon? Is it a fad or is it here to stay? What do the designers, retailers and academia have to say on this? REGISTRATIONS OPEN NOW. LIMITED SEATING. We are thankful to Project Otenga to partner with us on this project and believe in our ideology of bridging gaps in fashion and lifestyle fraternity.